Officially beginning their quest for a third Atlantic League pennant, the York Revolution (76-64) opens the best-of-five Freedom Division Championship Series tonight against the Sugar Land Skeeters (74-66). Game 1 from Constellation Field begins at 8:05 p.m. EDT. Pregame coverage on SportsRadio 1350 WOYK with Darrell Henry beings 20 minutes prior to first pitch. The Sugar Land Skeeters won the second half of the Freedom Division with a 39-31 record, three games better than the second-place Revs. The Skeeters are in the playoffs for the third time in their five-year history. Sugar Land last made the postseason in 2014, falling to Lancaster in the Atlantic League Championship Series. The second-half champion Skeeters will host Games 1 and 2 tonight and tomorrow. After a travel day on Thursday, the Revs host Game 3 on Friday at 6:30 p.m. and Games 4 and 5 (if necessary) at 6:30 p.m. and 1:00 p.m. on Saturday and Sunday, respectively. Right-hander James Simmons (11-9, 4.36) gets the nod for the Revs in Game 1; he will square off with Skeeters righty Sean Gallagher (10-8, 3.79). Simmons made starts in all six series against Sugar Land, going 2-2 with a 5.40 ERA (35 IP, 21 ER). He fared better at Constellation Field, where he went 1-1 with a 3.86 ERA (18.2 IP, 8 ER). Gallagher made two starts against the Revs, going 1-0 with a 3.97 ERA (11.1 IP, 5 ER). Game 2 will feature a matchup of York RHP Micah Owings (7-6, 4.30) and Sugar Land LHP Aaron Thompson (9-5, 3.98). Lefty Frank Gailey (6-5, 3.13) has been announced as the Revs’ Game 3 starter, while the Skeeters have not named one yet. The Skeeters won the season series over the Revs, 12-8. While the teams split the 10 matchups at PeoplesBank Park, Sugar Land made its bones at home, winning seven out of 10 at Constellation Field. The Revs are 38-62 against the Skeeters (40-65 including playoffs), and their .380 winning percentage is their lowest against any active Atlantic League club. Despite the losing record, several of the Revs’ biggest season wins – and Bryan Pounds’ key moments – came at the expense of the Skeeters. May 14 at York – On a night when York retired the number of pitcher Corey Thurman, the Revs and Skeeters played a game that would give Thurman and other pitchers nightmares. The Revs were down 3-2 before hammering five runs in the fifth, highlighted by Bryan Pounds’ bases-clearing double, to go up 7-3. Sugar Land responded with a five-run inning of its own in the top of the sixth, then added three more in the seventh to go up 11-7. York stormed back in the bottom of the eighth with six runs; Pounds again provided the pop with a go-ahead two-run homer over the Arch Nemesis. Mike DeMark pitched a perfect ninth for the save and the Revs ended the tumultuous night with a 13-11 win in a game that took over four hours. June 12 at Sugar Land – Down 4-2 in the top of the seventh, the Michael Rockett brought home a run with a two-out RBI single, putting two men on for Joel Guzman. Following the principle that “Everything is Bigger in Texas,” the Gooz cracked a towering three-run home run to deep left field. The Revs won 6-4, and NORAD is still tracking Guzman’s blast somewhere over Botswana. July 24 at Sugar Land – Down 7-4 after eight innings and with Skeeter closer Derek Loop taking the hill for the ninth, York looked dead in the water on this midsummer Sunday night. Little did they know the floodgates were about to open. Down to their final strike several times, the Revs tied it on Kevin Rivers’ two-out RBI single and took the lead on Pounds’ RBI single. 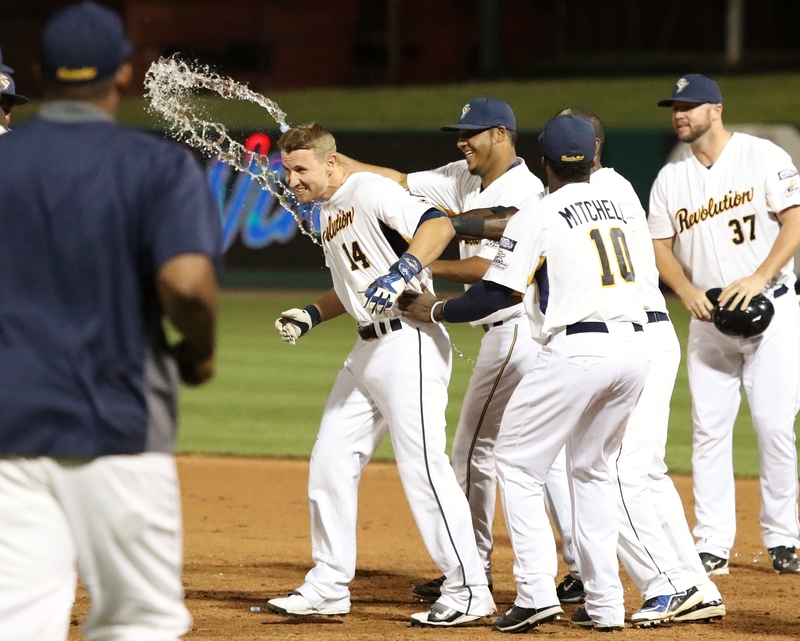 When the flood subsided the Revs had seven runs home – one of several seven-run ninths for York in 2016 – and escaped East Texas with a stunning 11-7 win. August 23 at York – With Sugar Land poised to take the second half Freedom Division or a wild card, the final Revs-Skeeters series of the regular season took on a playoff atmosphere. The first game did not disappoint as the teams traded the lead five times. Down 6-5 in the eighth, the Skeeters snagged the lead on ex-Rev Johan Limonta’s pinch-hit two-run homer over the Arch Nemesis. Facing Loop in the bottom of the ninth, the Revs again put their rally caps to work. Perez, Rivers, and Rockett led off with three straight singles to load the bases, and Brandon Chaves worked out a full-count walk to force in the tying run. After a strikeout, Pounds came up as a pinch hitter and grounded an 0-2 curveball to the left side of the infield that shortstop Josh Prince mishandled. Rivers came in to score and Pounds was again the walk-off hero. Pounds was King Clutch for the Revs in 2016, but none more so than against the Skeeters. Of his eight game-winning hits in York’s last at-bat, three game against Sugar Land. York and Sugar Land have met in the playoffs once before, coming together for a classic Freedom Division Championship Series in 2014. The teams split the first two at Constellation Field: the Revs rode seven scoreless innings from Alain Quijano to a 5-0 win in Game 1, while the Skeeters rebounded to win Game 2, 9-2. Game 3 at then-Santander Stadium featured perhaps the most noteworthy moment in Revolution playoff history: Sean Smith’s eighth-inning game-tying solo home run and the subsequent “Hop Seen ’Round the World.” Limonta singled with the bases loaded in the bottom of the 10th to give the Revs a dramatic 3-2 win. Gallagher and Logan Williamson engaged in a classic pitchers’ duel in Game 4 and the game went into extra innings scoreless. Sugar Land finally broke through in the top of the 10th on a Dominic Ramos RBI single, winning 1-0 to tie the series. A decisive Game 5 saw the Revs explode for three runs in the bottom of the first. York led 3-1 in the bottom of the fourth and seemed poised for more, but a controversial double play call ended the inning and shifted the momentum to Sugar Land. The Skeeters responded with a four-run top of the fifth, taking the lead on Ryan Langerhans’ two-run triple. The Revs got the tying and winning runs on base in the bottom of the ninth, but Salvador Paniagua grounded into a game-ending double play and the Skeeters escaped York with the game and the series, 5-3. York Revolution manager Mark Mason had admitted it freely: it’s hard to keep a team that hasn’t played a meaningful game in almost three months motivated. The Revs will play their most meaningful games of the year this week in the Freedom Division Championship Series, but before Tuesday night’s Game 1 at Sugar Land, it will have been since June 30 – the day they clinched the first half championship – that Mason’s bunch will have played a game that carried any postseason implications. Despite the novelty of playing more than half the schedule with the playoffs guaranteed, the Revs still had individual and team records at stake in the second half of the 2016 season. Adding a 36-34 second half to a 40-36 first, the Revs finished the season 76-64, notching the third-highest win total and fourth-highest winning percentage in franchise history. York held the best record in the Atlantic League for most of the season before finishing one game behind Somerset, the closest they have ever been to posting the league’s best season-long mark. York finished the season 43-27 at PeoplesBank Park, the best home record in the Atlantic League. York posted 44 comeback victories in 2016, breaking the record of 36 set by the 2008 and 2014 teams. Of those comeback wins, 15 occurred when trailing after the first six innings. York owned a winning record for much of the season when the opponent scores first (ending at 32-38, 22-20 at home). The Revs were 43-28 in games decided by 2 runs or fewer, including 26-8 at home (15-4 in one-run home games). The Revs handed out their seasonal awards at the end of Sunday’s finale against Long Island. Michael Rockett won team MVP, while Mike DeMark earned Pitcher of the Year, and Ty’Relle Harris took home the Corey Thurman Community Player of the Year. 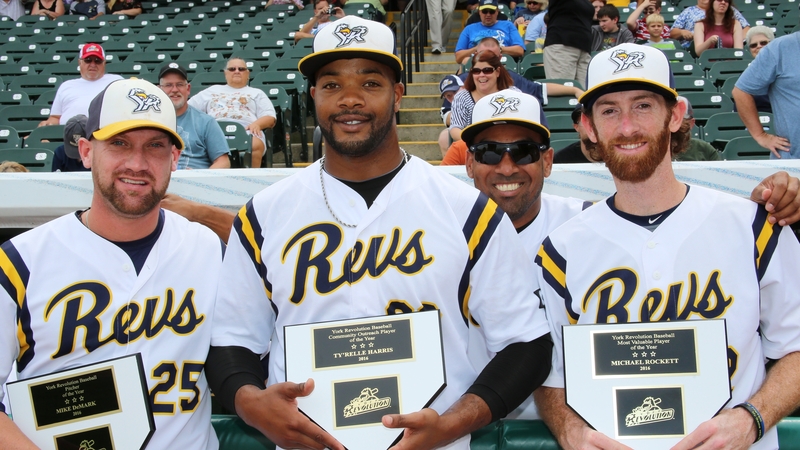 Voted team MVP in a landslide victory, Michael Rockett established himself as one of the Revs’ most important bats and gloves. He posted the best numbers of his career at the plate, batting .295 with a career-high 50 RBIs. He led the Revs in bunt hits and ranked top five in runs, hits, triples, RBIs, stolen bases, and infield hits. In the field, Rockett made multiple starts at six positions (LF, CF, RF, 2B, 3B, SS); he also served as emergency bullpen catcher and made one appearance as a relief pitcher. Mike DeMark proved so dominant on the hill that he forced the Revolution to hand out a Pitcher of the Year award for the first time ever. DeMark set club records with 39 saves in a Revs uniform (previous: 33, Rommie Lewis), and with 35 saves on the season (previous: 28, Rommie Lewis, 2014). He finished two back of legendary Somerset stopper Jon Hunton for the league lead in saves, and his 0.79 ERA was the best among Atlantic League closers by over a full run. DeMark was especially dominant from late July through early September, recording 13 saves and striking out 20 in a stretch of 16 scoreless games. He set team highs in consecutive scoreless appearances and in scoreless innings, not allowing a run in 17 full frames. In addition to transitioning from go-to reliever to trusted starting pitcher on the field, Ty’Relle Harris’s contributions off the field were numerous and impactful. From being a leader in making official team community appearances to simply engaging the fans on an everyday basis, perhaps his biggest impact was with the young fans. Harris could often be found before or after games at PeoplesBank Park conducting lessons with youth ballplayers or providing them with memorable inside access to the dugout and clubhouse. Harris is the first person to win the Community Player Award since it was named for York legend Corey Thurman, who received the namesake honor at his number retirement ceremony in May. Isaias Tejeda made his return to the Revs on August 19 after being released by the Atlanta Braves earlier in the month. Tejeda batted .364 (36-99) with eight doubles, three home runs, and 15 RBIs over 24 games in his second stint with York. After leaving in June on a 17-game hitting streak, he upped it to 28 games before seeing it end on September 3. Tejeda’s streak surpassed Vince Harrison’s 23-gamer in 2011 as the second-longest in club history, behind only Chris Ashby’s league-record 31-game streak in 2008. Tejeda’s 28-gamer was also the league’s longest since at least 2010 (as far back as records are available). A model of consistent greatness, Tejeda notched 32 multi-hit games (21 two-hit, 10 three-hit, one four-hit) in his 65 games with York, finishing with a .356 batting average. Throughout the first half, the Revs profiled as a classic Earl Weaver-style Baltimore Orioles team: built with power but not much speed. All of that changed when the Revs acquired Travis Witherspoon in a trade from Lancaster on June 16 and signed Jared Mitchell on July 2. The two formed a formidably fast duo at the top of the York batting order, quickly ascending the top of the team and league stolen base leaderboards. Witherspoon finished the season third in the Atlantic League with 41 stolen bases; his 34 with the Revs rank him third in single-season franchise history. Mitchell finished with 26 swiped bags, finishing tied for eighth in the league despite playing at least 20 fewer games than everyone else in the top 10; he also tied Eric Patterson (2014) for seventh in single-season Revs history. Frank Gailey finished fourth in the league with a 3.13 ERA, also good for the fourth-best single-season mark in Revs history. James Simmons finished tied for second in the league in wins (11), fourth in starts (26), third in innings (160.2), and sixth in strikeouts (118). In the York single-season book, Simmons finishes tied for fifth in wins (Rakers ’08, Thurman ’08, Martinez ’14), fourth in strikeouts, sixth in innings, and tied for second (Cody ’12) with 14 quality starts. Ty’Relle Harris’s 116 strikeouts put him seventh in the league and fifth on the York single-season leaderboard. A pair of familiar faces out of the bullpen also made their climb through the all-time Revolution record books. Ricardo Gomez tops out the year as York’s career ERA leader; his 2.37 ERA is more than 30 points lower than second place. Gomez also ranks eighth in games pitched and seventh in relief appearances (both 116), as well as tied for fifth with 22 saves after posting three in 2016. Julio DePaula is now fifth in games pitched and fourth in relief appearances (both 129) and 10th in ERA (3.46). After a splendid second half, Andres Perez tightened his grip on several Revs team batting records. He remains the franchise leader in home runs (66), hits (605), extra-base hits (206), total bases (952), doubles (131), RBIs (312), games (518), and at-bats (2042). His 297 runs are one back of Scott Grimes’s franchise record of 298; he is also second in walks (169) and tied for fourth in triples (9). Perez batted .289 with 25 doubles, 14 home runs, and 63 RBIs in 122 games this season. In four full seasons with the Revs, Dre is batting .296. With these records and more in the books, the York Revolution now turns its attention to the most important number: three. That will be the number of Atlantic League championships for the franchise if the Revs can win six games over the next two weeks.